The reticular formation consists of a disorganized network of neural fibres with the neurons’ cell bodies scattered inside of it. Through collateral connections, this structure receives information from all of the sensory modalities. When all of these different kinds of information converge on a single neuron in the reticular formation, they lose the specificity of their origin and acquire the non-specific property of activating the excitatory neurons of the wakefulness network. Other reticular cells increase muscle tonus and perform the work that is necessary but not sufficient for attention, learning, and voluntary movements. The reticular formation can thus be regarded as a sort of filter: out of all the various visual, auditory, and somatosensory stimuli that surround us all the time, it allows to pass through to consciousness only the infinitesimal fraction that are the most immediately useful to us, or the most intense. For example, if the noise from your computer fan is persistent but not too loud, after a while you simply stop noticing it. You can thus see why, without the reticular formation, it would be pretty hard to fall asleep in places that were noisy, uncomfortable, or brightly lit. The cortical activation necessary for you to be awake is made possible by an “executive network” for wakefulness, consisting of the posterior hypothalamus, the intralaminar thalamus, and the basal telencephalon. But this network is itself influenced by a fairly complex network of about 10 structures ascending from the lower brainstem to the basal telencephalon and thereby controlling wakefulness. Very schematically, the components of these ascending modulatory systems can be divided into two major pathways, one ventral, the other dorsal, both of which arise from a part of the reticular nucleus in the medulla oblongata. The ventral pathway is called the reticulo-hypothalamic-cortical pathway. It projects to the posterior hypothalamus and to the nucleus of Meynert, which consists of cholinergic neurons and is located in the basal telencephalon. 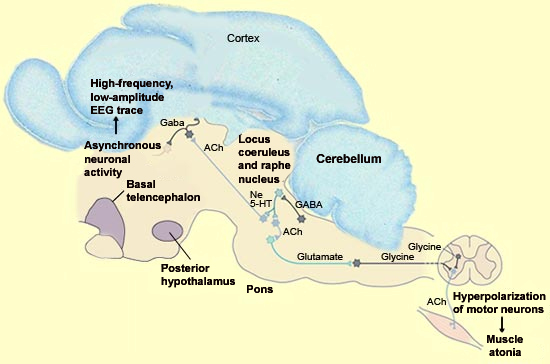 The dorsal pathway is called the reticulo-thalamic-cortical pathway. It activates the cholinergic mesopontine nuclei, the aspartergic and glutamergic neurons of the midbrain reticular formation, and the thalamus. In addition to maintaining wakefulness, several of the nuclei of these two pathways use acetylcholine and glutamate as neurotransmitters and are partly responsible for the cortical activation that occurs during REM sleep. The numbers of black dots are proportional to the activity of the aminergic and cholinergic systems during the various stages of wakefulness and sleep. Here are descriptions of some of the most important brainstem nuclei involved in the wakefulness system. The midbrain reticular formation projects massively into the thalamic nuclei, which in turn influence the entire cortex. The role of this formation is to desynchronize the cortex in the broad sense, thus facilitating not only wakefulness but REM sleep as well. Formerly known as the ascending activating reticular system, it is now regarded simply as part of the wakefulness network. The cholinergic mesopontine nuclei also project to the thalamus. The acetylcholine produced by these nuclei has two effects: it reduces the activity of the thalamic reticular nucleus, which is part of the sleep system, and it activates the thalamocortical neurons involved in wakefulness. The magnocellular medullary reticular nuclei, whose neurons are cholinergic or aspartergic/glutamergic, are the origin of both the reticulo-thalamic-cortical pathway and the reticulo-hypothalamic-cortical pathway. Their projections therefore run to the midbrain reticular formation and the cholinergic mesopontine nuclei, as well as to the basal telencephalon and the posterior hypothalamus. 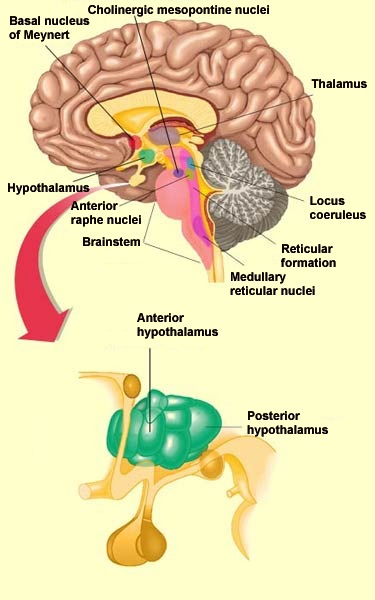 The nuclei of the locus coeruleus are located in the dorsal part of the pons, and their noradrenergic projections influence brain structures such as the thalamus, the hippocampus, and the cortex. The locus coeruleus is at its most active when an individual is awake and active. It is less active during calm wakefulness, even less active during non-REM sleep, and completely quiescent during REM sleep. The serotonergic nuclei of the anterior raphe (also known as the superior raphe) send serotonin to the hypothalamus and the cortex. These nuclei are active during wakefulness. Their overall effect is to support wakefulness, and, unlike with other groups of aminergic neurons, lesions to these nuclei not only do not cause even transient sleepiness, but actually cause prolonged insomnia that lasts several days. The likely reason for this apparent contradiction is that this system, which innervates the anterior hypothalamus both in the preoptic area and in the circadian clock circuits of the suprachiasmatic nucleus, seems to measure the duration and intensity of wakefulness. Wakefulness might thus eventually cause its own inhibition through a negative feedback loop. In other words, having been awake for a certain time leads to sleep. All of these structures in the brainstem receive collateral projections from the sensory and vegetative inputs which thus help to maintain their activity (see sidebar). Thus we are talking about a complex network in which the pharmacological excitation of one component leads to the activation of all the others. This redundant arrangement also explains why the deactivation of a single system is followed, after a few days, by a complete recovery of wakefulness. Thus, taken in isolation, none of the structures just described is indispensable for the activation of the cortex. Researchers can generate PGO waves during wakefulness, rather than during REM sleep, by exposing their subjects to sudden, strong stimuli that startle them. This suggests that the PGO waves that arise spontaneously during REM sleep may be generated by the internal activation of the neuronal circuitry of the startle reflex. The activity of the pontine inhibitory neurons affects not only the motor neurons, but also the nuclei of the dorsal columns, where, during REM sleep, these pontine neurons reduce responsiveness to somaesthetic stimuli. In some people (usually older men), the mechanism of muscle atonia that normally accompanies REM begins to fail, which can sometimes cause injuries—either to these people themselves, or to their bedmates. Rapid-eye-movement sleep, usually known simply as REM sleep or paradoxical sleep, has an EEG pattern similar to that of wakefulness and results from a complex interaction between nuclei in the brainstem, structures in the limbic system, and areas in the cortex. REM sleep has other surprising characteristics as well, and their mechanisms too have been located in specific areas of the brain. One of these characteristics consists of the rapid eye movements that occur during REM sleep and from which it gets its name. Their purpose is unknown, but it is known that the signals generating them originate in the pontine reticular formation and are transmitted to the motor layers of the superior colliculi. The collicular neurons in turn send projections to the paramedian pontine reticular formation (PPRF), which co-ordinates the duration and direction of these eye movements. Another singular characteristic of REM sleep whose source has been located is the near-total bodily paralysis that accompanies it. The intense neural activity observed during REM sleep excites the vast majority of the neurons in the cortex, including those in the primary motor cortex. These motor neurons thus generate organized sequences of activities that represent commands for bodily movements. But during REM sleep, only the respiratory muscles and the muscles of the eye and the middle ear will actually be able to carry out these commands–they never reach the motor neurons of the arms and legs. During REM sleep, the increased activity of cholinergic neurons in the pons excites other, glutamergic neurons in the pontine reticular formation. These neurons in turn send projections to and activate interneurons in the magnocellular reticular nuclei of the medulla. The axons of these interneurons descend into the spinal cord, where they release glycine, thus strongly inhibiting the motor neurons by hyperpolarizing them. Source: Adapted from Principles of Neural Science, Kandel, Schwartz, and Jessell, Eds., Appleton & Lange, Pub. Another feature of REM sleep, the pontogeniculooccipital (PGO) spikes that occur intermittently during it, also originate in the pontine reticular formation. They then propagate via the thalamus to the occipital cortex, though as their name indicates, they are more readily detectable in the lateral geniculate nuclei, which act as relays in the brain’s visual system. PGO waves are among the various phasic events that occur during REM sleep, along with the rapid eye movements and changes in breathing and heart rates. PGO waves can be generated in the absence of REM sleep by stimulation of the pons with acetylcholine, especially in the peribrachial area of the pons. It is in this reticular area, around the superior cerebellar peduncle and underneath the locus coeruleus, that PGO waves are generated. Many of these neurons that project to the thalamus are cholinergic. They briefly fire action potentials just before each PGO wave on the ipsilateral side of the brain. The serotonin in the raphe system inhibits PGO waves by hyperpolarizing the cells that generate them. We can thus understand why the halt in the activity of the serotonergic cells during the transition from non-REM sleep to REM sleep triggers PGO waves.